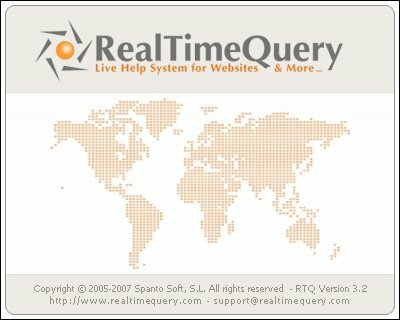 RealTimeQuery is a program for offering online support to your customers in your website. With RealTimeQuery your visitors can choose to contact you in real time while they are visiting your website. RealTimeQuery acts as a server on your PC, it listens for connections from your website, opening a direct communication channel between you and your customers. RealTimeQuery can use several operators. RealTimeQuery can track your website visitors. Operators connected to the system receives information about who is in your website. The program can run in the background, accessible from the system tray and alerts you with sound and a popup window when a user calls you from your website.